There are authors who I love and whose work I relentlessly devour, and there are authors who I love despite having only read a small amount of their output. Shirley Jackson belongs to the latter category. 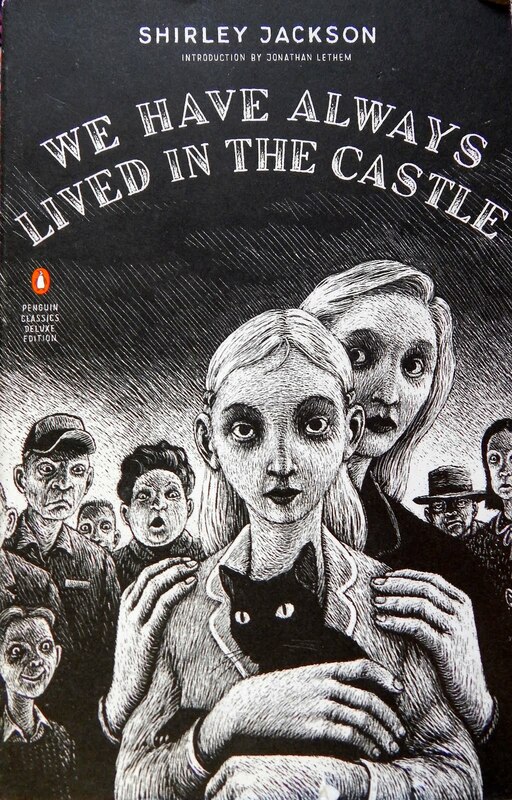 I greatly enjoyed The Lottery and The Haunting of Hill House, and dove into We Have Always Lived in the Castle after being reminded of her in a New Yorker article. What a great book! It's a fast, propulsive read, with one of the most compelling narrators I've encountered recently. It isn't supernatural like The Haunting of Hill House, but achieves a somewhat similarly creepy vibe: more of a psychological thriller than a ghost story. I knew this book was going to be good from page one. It starts with what has quickly become one of my all-time favorite opening paragraphs. Isn't that great?! I love how the writing sort of slides downward as it continues. Reading this for the first time, the line about a werewolf made me stop short, re-parse, go back, and eventually go "Ohhhh... this is an interesting person we're hearing from!" Merricat is fascinating. She isn't unreliable in the traditional sense, but she has a very well-defined psychological profile. Particularly in the early chapters, she's primarily distinguished by her misanthropic outlook, which is vast and deep. Merricat sees herself and her family as the persecuted victims, but you can see a broader cycle of hate at work. The village treats Merricat awfully, taunting her and shunning her and physically blocking her. Given her hateful interior monologue, though, I imagine that Merricat is probably glaring and scowling at everyone she meets: even though she doesn't act out against them, her attitude likely eggs them on. You can easily imagine her as a straightforward villain in another story, even though we're inclined to view her sympathetically in her own. The novel is filled with little rituals and tokens, mostly objects to which Merricat attaches some powerful significance. This starts out fairly commonplace, with a long meditation on a particular pattern of cracks outside a specific house, which Merricat has avoided stepping on ever since her childhood. That feels familiar, the kind of nonsensical but still diligently-observed behavior that young children exhibit. But she goes far beyond that: nailing books to trees in order to keep out unwanted visitors, burying silver dollars in the river to ensure her family's health, smashing glass or mirrors to damage hostile spirits. That's, uh, not normal, especially for an adult of eighteen. Which raises the question for me: has Merricat always been like this? That's probably the best explanation, which also covers her behavior in The Incident, but I'm not sure if we have enough information within the novel to know for sure. I can imagine her maybe being only slightly peculiar as a child, and sliding further into it after the stresses of living in the orphanage and dealing with any mental backlash from her actions. Along with the rituals, Merricat seems to have a set of rules that she is "not allowed" to do. At first I thought that this meant Constance forbade her from doing those things. That seemed a little odd, though, since Constance is habitually pleasant and indulgent. I now think that these are interior rules that Merricat creates herself, perhaps for self-preservation of her mental and physical safety, but then externalizes to an outside authority to keep herself from breaking them. Once she has decided that something is "not allowed," she will not be moved from the ban, even though she's the one who created it in the first place. And what is Constance's deal? She doesn't seem "normal" either, although she is a lot easier to like than Merricat. She may have also had a slide, starting out fairly normal and retreating after the anxiety of the trial. It's really interesting to see how she and Merricat complement one another: given Constance's warmer personality, it would make more sense for her to be the public face of the Blackwoods; but because she bears the blame for what happened, Merricat carries out that awful role. They protect one another and care for each other deeply, which forms a sweet heart of the novel, but also... I dunno. Is it good and healthy for them to shut out the outside world? Maybe it is! Visitors like Helen Clarke and Charles Blackwood do seem to make reasonable arguments: that it's time to move on, that the sisters need to re-engage with the world. Helen seems well-meaning but useless. Charles, of course, has a more sinister sheen, and it's interesting to unpack who he actually is from Merricat's perception. Obviously he isn't a devil or a ghost. What is his goal? My assumption is that he wanted to mooch from and/or defraud them, given his obsession with money and possessions. But he doesn't seem to be making a big play, and spends most of his time and attention on small items instead of the overall estate. It is curious that he gave up the pursuit so soon after the fire. I don't know if he was just scared off, or if he wasn't all that motivated to start with, or what. Charles makes an effort early on at winning them over, but the way he talks to Jonas about Merricat quickly becomes menacing and weird. Seeing that made me wonder whether mental illness runs in the Blackwood family. He doesn't have the excuse of trauma (that we know of) to explain his behavior, but he shares similar tendencies of paranoia and hostility, to which he adds manipulation and greed. Along the same lines of inherited illness, I'd initially assumed that Julian was disabled as a result of the poisoning, but I now wonder if it preceded the incident. It would explain why Julian and his wife were living with them, the conversations about helping out and not being a burden. He seems to acknowledge that the arsenic has damaged him, but it might have broken something that was already bent. The book gets really exciting for a couple of pages when Julian raises the idea that Merricat is dead. That doesn't make any sense given her trip to the village, but it made me consider various other possibilities. Maybe Constance is dead. Maybe only one sister survived and re-invented the other. I'm just as happy that this ended up not being the case, though. It's nice to keep this intense story grounded without reaching for supernatural complications. The freakout of the villagers near the end was awful and terrifying. The scene of a roiling destructive mob reminded me of the lynching scene in To Kill a Mockingbird, although in this case the voice of reason arrived far too late and wasn't as good a voice as Atticus Finch. Of course, in the real world, hate mobs do immense harm and are rarely stopped at all. I admired the sisters for simply enduring this horrific persecution, even while their world is shattering around them and their lives permanently changed. As the story reaches its conclusion, you can see the legend being created, being propagated. In a generation this will become "the house where the two witches live" or whatever, and villagers will continue their own rituals of offering sacrifices, because that's what has been done. And for all that Merricat wanted everything to remain the same, the world actually evolves in a way that's tolerable to them, perhaps even more so than before: they're left alone, and are still provided for. I was pleasantly surprised that the book ultimately ends on a fairly upbeat, though still weird, note. That would be a horrible situation for me to be in, but they're able to find the good in it and hold on to what's important: each other. Shirley Jackson isn't exactly renowned for happy endings, but despite everything, Merricat and Constance ARE happy. This might be a tragedy to the rest of the world, but not for them. I, uh, liked this book! It's surprisingly affecting, especially with such an odd protagonist at the center. Much of the mystery comes from parsing out the narrator's inner thoughts, which dovetails nicely with the exploration of dark attitudes surrounding her. It gripped me all the way through, and I suspect I'll remember Merricat for some time to come. I'm still thinking about Dietrich Bonhoeffer a lot. 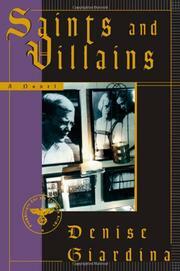 My dad recently recommended "Saints and Villains", a novelized biography by Denise Giardina, which I have greatly enjoyed reading. The writing is fine, and the story is excellent: his life is incredibly compelling to begin with, and she helps make it even more accessible and moving, portraying a believable inner life for him and exploring the moral struggles he faced while opposing the Nazi government. But while he was politically constant, he was personally and theologically in flux. He wasn't an especially committed or passionate believer early in life: he decided to study theology because its intellectual rigor appealed to him, not because it spoke to his innermost feelings. Well into his adult life, he didn't think of himself as an especially religious person. As shown here, and backed up by his biography, he had a sort of spiritual awakening during his time in Manhattan and Harlem: first by connecting with the African-American church, and then through seeing how his fellow-seminarians were engaging with the world around him to combat poverty, injustice, and bigotry. Suddenly, theology was not merely an abstract system to analyze: it was an urgent call to action, a clear demand for how Christians should behave in this world. This is one area where the novel takes a few liberties, coloring in details that (to the best of my knowledge) aren't supported by his biography but are in keeping with what we know of his thoughts and actions. Dietrich did explore America, borrowing a car and driving with friends to Mexico and back. In the novel, this includes a longish interlude in Appalachia, where he witnesses an even more brutal form of the anti-black racism that already appalled him in Manhattan. These incidents don't occur in a vacuum: Giardina portrays the systems of wealth and power that benefit from such oppression, and throughout the novel sympathetically portrays the socialist activists who seek to dismantle those systems, whether in the Old World or the new. Dietrich doesn't directly join their ranks, but is moved by all they show him, and evolves his scholarship to accommodate the wider world he finds. It's very tempting for Americans to point with horror at all that occurred in the Third Reich, and Giardina doesn't shy away from that horror, but I'm really glad that she shows how the United States actually influenced Nazi racial policy. At the time of Dietrich's visit to America, our own laws were far crueler than anything he had seen: from the codified white supremacy of Jim Crow to the genocide of Native Americans, we were much more discriminatory and hateful to our own citizens than the vaguely multicultural Weimar Republic. It's very believable that Dietrich's witnessing of our strict segregation primed him to be alert when those ideas began to be espoused by the fascists: when everyone else dismissed Hitler as a loudmouth who didn't mean what he said, Dietrich clearly and forcefully denounced the ideology and where it was heading. Bonhoeffer does admirable things, but, contrary to what you might think from the title, he isn't a saint. I loved how Giardina focused on his humanity, showing the many imperfections of the man. He came from a very privileged life, had the luxury to pursue whatever career interested him, and throughout his life was attached to his comforts: his cigarettes, fine food, classical and jazz music. He wasn't a revolutionary by nature, and wasn't especially brave, but I think that makes it all the more impressive that he did the right thing. Someone who feels intense fear and has a lot to lose, but still does it anyways, can be more compelling than someone who is afraid of nothing and has nothing left to lose. His romantic involvements are another element that might raise an eyebrow. On paper, I was a bit skeptical of the invention of Elisabeth: it sounded like it was trying to give a more personal reason for Dietrich to oppose anti-Semitism and eventually help smuggle Jewish victims out of Germany, instead of just doing it because it was right. As the story unfolded, though, I was happy with how their relationship ended up. Elisabeth is ultimately more important for the window she opens on the Jewish experience, not for her influence on Dietrich. He lives in a more rarefied social circle and, apart from his brother-in-law, doesn't have much insight into the gradually intensifying prejudice faced by this group. Elisabeth shows how insidious and gradual the growth of anti-Semitic policy was, and also how... almost banal it could be. She doesn't even consider herself Jewish at the start of the novel, since her family converted to Christianity generations ago, and those who meet her don't question her identity. By the end, the Nazi obsession with racial purity has her wearing a yellow star and hiding out in a nearly-abandoned apartment building. She helps turn the abstract into the concrete, connecting Dietrich's moral principles to a physical reality. The real-life situation with Maria seemed to be handled well. Giardina doesn't wave away or excuse the oddness of this situation, where Dietrich became engaged to (but apparently was never physical with) a woman half his age. Again, she focuses on the humanity of the people involved. Dietrich comes off as a bit smitten, a bit confused, a bit cerebral, and, near the end, a little desperate. Maria is young, vulnerable, romantic, optimistic, trusting, and, near the end, filled with pity. I thought it was a very good choice to focus on Maria. She's one of the very few viewpoint characters in this story, and, though that special insight, we can track her own evolution of feeling and the brave decisions she makes as the novel nears its end. It's clear for some time that Alois Bauer will be involved in Dietrich's inevitable death. I don't think I ever quite clicked with what Bauer was doing or who he was supposed to be. Given his chapter titles, it seems that he's intended to be Bonhoeffer's doppelganger, but I'm not sure what that means. They have different backgrounds: Bonhoeffer is aristocratic, Bauer bourgeois. They have different personalities: Dietrich is generally quiet and thoughtful, Bauer more impassioned and assertive. They have vastly different outlooks on life: Dietrich is a Christian with a deep belief in God that guides his actions, Bauer is an agnostic and motivated by his self-interest. Their roles, of course, diverge tremendously, with Bonhoeffer diligently trying to bring down the Third Reich with any means at his disposal while Bauer, until the end, works tirelessly to strengthen and spread it. Anyways, given all that, and the fact that they don't seem to look alike, I'm curious what aspect would make them seem to be doppelgangers. I'm also not sure what to make of Bauer's love of Mozart, which seems to be very significant given the section titles and his recurring obsession with the manuscript. It does make for a somewhat interesting contrast with Bonhoeffer's love of Bach, especially if you look towards their originators: Mozart is more remembered for breaking norms and advancing himself, while Bach focused more on praising the divine. Anyways... was the music intended to humanize Bauer, to emphasize that Nazis were also people with passions of their own and not just mindless murdering robots? Is it just supposed to define him more as a character, give him a quirk to differentiate him from the various other less-important Nazis? Or what? Even knowing how the story must end, I thought the plotting near the end was done extremely well. You can't help but hope that the assassination attempts against Hitler will succeed, even knowing that they failed. There's an agonizingly long lull as Bonhoeffer languishes in Tegel prison. And, as Bauer closes in on him, it seems to move in one direction, and then lurches in another, with a cruel promise of escape for Dietrich right before the conclusion. I was surprised by just how emotional I felt at the end. I'd enjoyed reading the book and revisiting the story, but also felt a certain distance. The last page, though, hit me really hard, and it's still kind of reverberating for me. Difficult times reveal just how extraordinary people can be. If Bonhoeffer had been around before the Great War or after the Marshall Plan, he would have written some good theology (maybe more than he did, thanks to a much longer life) and spoken out against injustice. But because evil was so strong and so visible in his lifetime, he had the opportunity to make a far bigger impact. And so he did: not because it was in his nature, but because he felt compelled to do so, and pursued his mission wholeheartedly. This book reinforces Bonhoeffer's status as one of my heroes, and I'm glad to have a perspective that breathes new life into the man and his story.